New York City is the largest urban center in the United States, with more than 20M people in its metropolitan area. The region has a combined coastline of ca. 2,400 km, and large segments of its population, and considerable infrastructure, are located in areas at significant risk from flood damage. The Port of New York handles a significant fraction of North American trade, and high-volume shipping and industrial activities contribute heavy metal and petrochemical pollution to the surrounding area. Intensive human activity strains the surrounding terrestrial and aquatic environments and poses serious health risks to the community. Brooklyn is central to these issues, and a fertile laboratory for students interested in understanding urban ecology and the environment. 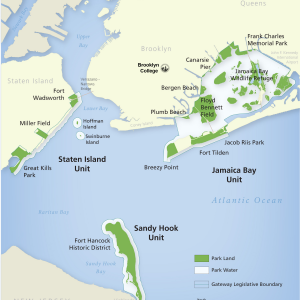 Situated on the southwestern end of Long Island, Brooklyn is bordered to the west by the East River and by the New York and New Jersey harbors, to the south by the Atlantic Ocean, and to the east by the wetlands of Jamaica Bay and the Gateway National Recreation Area, one of America’s largest urban parks. The borough of Brooklyn is home to ca. 2.5M residents, 70% of whom are minorities (nearly 1M African-Americans and 500,000 Hispanics), making it the largest and most diverse of NYC’s boroughs. Brooklyn College, part of the City University of New York (CUNY), enrolls more than 14,000 undergraduates, ca. 45% of whom are underrepresented minority students. Centrally located in the borough, BC serves as the academic heart of Brooklyn, and is home to its only marine and environmental research facility, the Aquatic Research and Environmental Assessment Center (AREAC), and a recently established interdisciplinary undergraduate program in Urban Sustainability. Urban Ecology and Sustainability are identified as priority areas in the College’s most recent strategic plan, and to this end, BC has invested significant new resources in research equipment and infrastructure, facilities, and faculty appointments. These efforts have culminated in the development of a new Science and Resilience Institute at Jamaica Bay (SRI@JB), a consortial effort led by BC/CUNY, which will establish a new center for sustainability research and education on Jamaica Bay and its watershed. BUEE is an integral component of the educational mission of this broader institutional effort.